http://flevy.com/blog/wp-content/uploads/2019/04/pexels-photo-209151.jpeg 500w" sizes="(max-width: 300px) 100vw, 300px">For some, running their own small business is the ultimate dream, and thanks to modern technology and low startup costs (depending on the sector you want to work in), it is now a dream that can much more easily become a reality. Although all businesses will be different and run in their individual ways, one thing they should all have in common is a website. 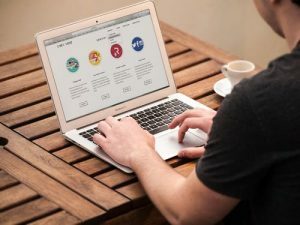 Having a website is crucial if you want your business to be a successful one, and here are some of the reasons why this is. Take a look online, and you’ll see that there are many thousands of businesses out there, all vying for customers. If your business only exists in the physical realm, you won’t be able to compete with all of the others that are either selling in both the online and offline space or are solely working on the internet. You could be losing out on thousands of sales because you are not open to as many customers as you could be if you had a website. You wouldn’t even have to work any harder than you do now, since with a good hosting company such as Onyx.io the website will work for you in the background, yet you will be making more money as a result. A website also means you can lower your costs (assuming you don’t have a physical shop as well) because you will have fewer overheads, and you can be competitive in this way too. It can be hard for customers to know which businesses to trust and which they should stay away from, but if you have a website, it will be that little bit easier to know you. Use your website to let your customers and potential customers know more about you; offer them some history about who you are and why you started the business in the first place – this will help them to feel as though they know you and that you are trustworthy. Plus, a backstory can make your products more interesting to them. It’s not just what you put on your website that makes people trust you more. The very fact of having a website is a great start when it comes to gaining trust. A company that only exists to scam people or who isn’t interested in good customer service might not bother to make a website, sticking to using social media alone instead. Therefore, a website is a sign that you intend to be around for a long time to come, and that you will look after your customers. What people are looking for these days is a way to buy what they need or want whenever they have the chance to. Everyone is busy, and it might be that people can’t get online until late at night, or only have a few minutes early in the morning to browse. If you only have a physical store, you will miss out – they might be working or otherwise unavailable when you are open. A website is always open, allowing customers to find out about you or buy products whenever it suits them. This constant availability is excellent for everyone and will boost your profits in the end. BSE Ltd., Asia’s Oldest Stock Exchange, to Go Public!